With Vancouver Detached home prices growing 34% over the past two years (according to the MLS Benchmark) homeowners have benefited greatly from a windfall of equity, on paper anyways. This has resulted in homeowners using their homes as ATM’s, drawing down equity to finance their Vancouver lifestyle (Homeowner refinancing up 27%). This has helped cushion the blow of paltry wage growth. However, with a widening wealth gap, increased Government spending and political pressures, one has to think Governments will target wealthy homeowners next. Especially considering property taxes have failed to keep pace with home values. As you’ll see in the charts below, the median tax rate (annual tax paid divided by sale price) for detached homes has failed to keep pace with home prices. While property taxes have increased on a nominal basis, they’ve actually been falling as a percentage of home value. Annual property taxes for Vancouver West Detached homes are just under $9000/ year, or around 0.25% of the homes value (based on median sales price). 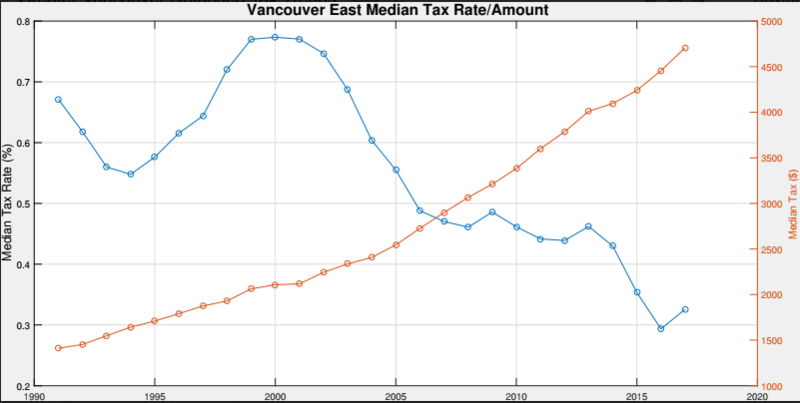 On the Eastside, property taxes as a percentage of median sales price is hovering just above 0.3%. Annual taxes paid has been increasing on a nominal basis every year, but again nowhere near recent home price appreciation. Despite substantial equity gains, homeowners are deferring payment of property taxes at a record pace. 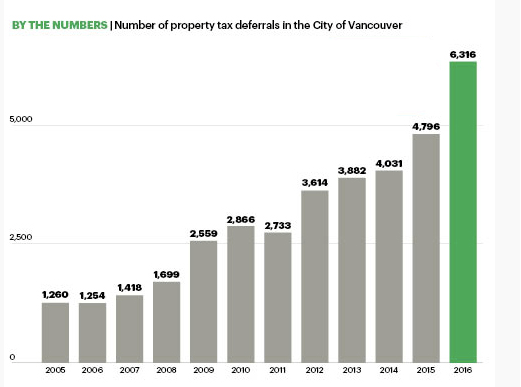 Property tax deferrals have increased five fold over the past ten years. Suggesting a growing trend of homeowners are facing cashflow problems (likely an aging boomer generation). This creates a unique situation, will some homeowners be forced to sell if taxes continue to rise? Many homeowners experienced a 30-40% increase in property tax assessment values last year, creating a growing increase of tax deferrals and financial stress on some households. Yet despite the tax increase, data suggests taxes have not kept pace with rising home values. Meanwhile, Governments are facing rising political pressure to tax the rich (See protestors demand mansion tax) and curb home prices. This makes Real Estate a vulnerable target for the next tax grab, regardless of the direction of home values.